Shrewsbury Town have agreed to extend the initial one-month loan deals for both Blackpool's Bobby Grant and Fulham's Jack Grimmer until January. 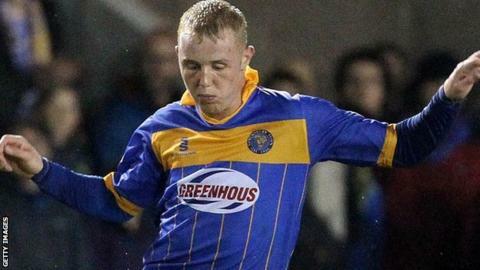 Since making their debut against York on 18 October, striker Grant, 24, and defender Grimmer, 20, have each started five consecutive games for Shrewsbury. In those games the club have picked up four league wins in a row. "They can be satisfied with the part that they've played so far," manager Micky Mellon told BBC Radio Shropshire. "They've brought quality and major energy. "They came into the group and became part of it very, very early. They're good guys." Both parent clubs have the option of an immediate recall on the players.